By indiamike.com. Created on Jul 4th, 2013. Last updated on Mar 8th, 2019. A trip to the Himalayas, the tallest mountains in the world,is a worthy journey for every adventure seeker. Whether it is climbing lofty peaks, trekking or just plain wandering on gentle slopes, the vistas offered by the Himalayas are an experience to behold! Depending upon whether you are climbing or walking, you need to be prepared with a few essential items in your baggage. 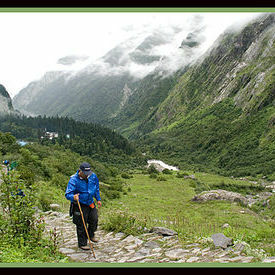 Here is an indicative list of items that could be useful in your trek in the Himalayas. Sturdy Footwear: Comfortable and sturdy footwear is the most important thing for any expedition to the Himalayas, where you will typically end up walking a lot. If you are doing some rigorous climbing make sure you have proper mountaineering boots. If you intend to go to snow bound regions, special shoes may be required get a good grip in the snow and to keep your feet warm as well. Warm Clothes: Several layers of clothing will be required for your journey. Preferably full sleeved tops and full length track pants, a light sweater and warm jacket. Carrying both thin and thick socks will give you options to wear depending upon what the weather is like each day. It is also important to carry some warm hand gloves, and thermal wear as you never know how chilly it may get in altitude. Sun protection: At higher altitudes, UV rays can be quite strong. Hats, UV filtering sunglasses and a high SPF sunscreen will help shield your face and eyes from the strong rays of the sun. Read: Packing for a Himalayan Trek. Headlamp: Most villages around the Himalayas may not have too much street lighting and you might be happy to have a convenient hands-free headlamp in case you don’t get to your hotel/camp in daylight and for making that trip to the bathroom at night whilst camping. Also, carry spare batteries for your headlamp. Hand Sanitizer: Running water may not be found everywhere and a small travel hand sanitizer bottle may be useful before you have your snacks. Water: A one liter reusable water bottle should be carried at all times. Buying water on the way may not be possible all along, so it is a good idea to carry some water purification tablets that can be bought locally. Alternately, buy a portable UV filter such as ‘SteriPen’. It is also better for the environment to sterilize your own water rather than accumulate plastic bottles. Read: Packing for a Trek. Medical kit: A basic medical kit to reasonably prepare trekkers for minor problems could turn out to save the day. Some things it should include are gauze bandages, disinfecting lotion, aspirin, an antibiotic, duct tape or moleskin for blisters, lip balm and sunscreen. Backpack: Your backpack should preferably be of light material with a waist strap. You may have a porter to carry your large bag, in which case, you should also carry a smaller light backpack with a few essentials you will require during the day whilst on the trek. Snacks: Food such as energy bars, nuts, chocolates or candy you like to satiate those hunger pangs can be taken in small amounts to enjoy on those pleasant breaks that you will need to keep you going on that arduous trek. This is an indicative list that will help you immensely on your visit to the Himalayas. You probably will have other essentials that you can’t do without – your camera, extra lenses, an extra set of undergarments, non trekking comfortable camp shoes/slippers, an e-reader (instead of books) and so on.